Google's Android looks unstoppable, with quarterly sales steamrolling the iPhone in the U.S. and now Windows Mobile globally, but it's only the eye of the storm for the young operating system. Gartner's latest statistics show big gains for Android's quarterly sales worldwide, jumping from 1.6 percent in the first quarter of 2009 to 9.6 percent during the same period this year. 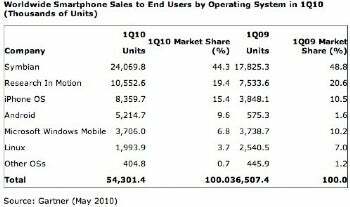 That puts the OS ahead of Microsoft's Windows Mobile, but still behind the iPhone, Blackberry, and Symbian phones. Besides Android, only the iPhone has gained sales share since Q1 2009, says Gartner. We know plenty about Apple's next iPhone thanks to Gizmodo's purchase of a prototype. If Apple does release an iPhone with a front-facing camera, higher-resolution screen, and custom processor, it'll create the summer sales spike to which we've grown accustomed. Sales of the Palm Pre and Pixi have been a disappointment, but HP's $1.2 billion acquisition of Palm could be the kick in the pants WebOS needs. Neither company has announced any new products, but when they do, it'll could rock the smartphone world. WinPho7 is still a distant thought with a holiday launch planned, but it's clear that Microsoft is gunning for the now-lucrative consumer market with an emphasis on social networking, fun apps, and Xbox Live support. Microsoft has traditionally targeted business users, but it sees what Apple and Google are doing and wants a piece of the action. Add Research in Motion to the pile of smartphone makers clamoring to make fun phones. The next version of Blackberry's operating system improves the Web browsing experience with Webkit, and includes a "social networking feeds" application, crisper graphics, and flashier animations. Not mind-blowing in terms of innovation, but enough, perhaps, to keep Blackberry on top in the United States. Symbian doesn't capture the minds and dollars of U.S. consumers, but it's still the dominant smartphone platform overseas. Whether Nokia intends to change that or not, the upcoming N8 is a nice-looking phone, with a front-facing camera, a 12-megapixel rear camera, and the revamped Symbian 3 operating system. If Nokia can put out a killer product at a reasonable price, it's bound to get attention stateside.